Free-scoring Louth Old Boys made it five straight wins as they put eight past East Lincs Combination rivals Ludford Rovers on Saturday. Having thrashed strugglers North Thoresby 11-1 the previous Saturday, Old Boys travelled to fellow mid-table side Ludford and returned 8-3 winners. The result made it 28 goals in five games and lifted them up to fifth in Division One. Ellis Barker was at it again as he scored four for the second game running to take his season’s tally to 23 as Louth went in at the break 4-0 up. Second-top scorer Aron Burton bagged a double to make it 11 for the campaign, while Joshua Blakey and Sam Swaby completed the demolition. With just three league games left to play this season, Louth could improve their incredible scoring run on Saturday when they host bottom side Scamblesby who have shipped 70 league goals this season. Kick-off at London Road is 1.45pm. In Division Two, AFC Louth’s difficult season continued with an 8-0 thrashing at home to Manby FC. The visitors scored four times in each half through Kieran Marks (4), Ryan Johnson (2), Jake Tindall and Callum Hill. 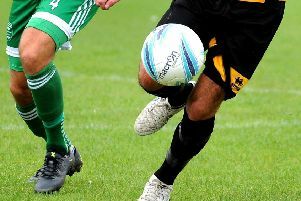 Promotion-chasing Alford Town saw their trip to Chapel Swifts called off after the home side withdrew from the league. And Sutton Rovers conceded their Town Trophy tie at Cleethorpes Town A. On Saturday, Alford and Sutton are both in cup action in the quarter-finals of the Charity Cup (ko 1.30pm). 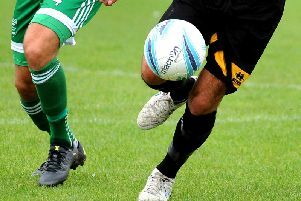 Sutton are due to entertain North Cotes, while Alford host Marsh Rovers. None of our Division Three sides were in action last weekend, but Louth Old Boys Vets return on Saturday in the first group game of the Tom Sandys Trophy at North Somercotes United Reserves.